GWANGJU, S. Korea – The sports discipline of men’s baseball is shining on the International University Sports Federation (FISU) Summer Universiade stage, where eight of baseball’s university-based National Teams are competing for the first time in 20 years. The Korean Baseball Association (WBSC Member Federation) is leading the coordination of baseball at the Summer Universiade, which, according t FISU’s own portal, is “enjoying a big comeback”. In additional to a huge opening crowd to watch rivals Japan and host Korea square off, in which Japan won 8-0 at newly built Kia Champions Field, South Korean baseball legend Chan Ho Park had a leading role in Gwangju 2015’s ‘first act’, having been given the biggest honour of　igniting the cauldron to celebrate the official opening of the 2015 Summer Universaide. As baseball and softball continue their push to return to the Olympic Games in 2020, it can be considered a boost that the sport is generating positive exposure on an important multi-sport stage with young athletes at the heart of the movement, while delivering benefits for FISU and Universaide organisers who made the decision to bring it back to their platform. “It is a big deal for us to be back in the University Games,” said Petr Ditrich, WBSC’s appointed FISU Technical Delegate and president of the Czech Baseball Association. Baseball is the leading team-sport in South Korea, and thrilled audiences at the 2014 Asian Games in Incheon. The Korean Baseball Organization (KBO) League KBO -- South Korea's top professional sports league and WBSC Member – expanded in 2015 and is on pace to exceed eight million in fan-attendance for the first time in its history. Kia Champions Field is home of KBO’s Kia Tigers club. 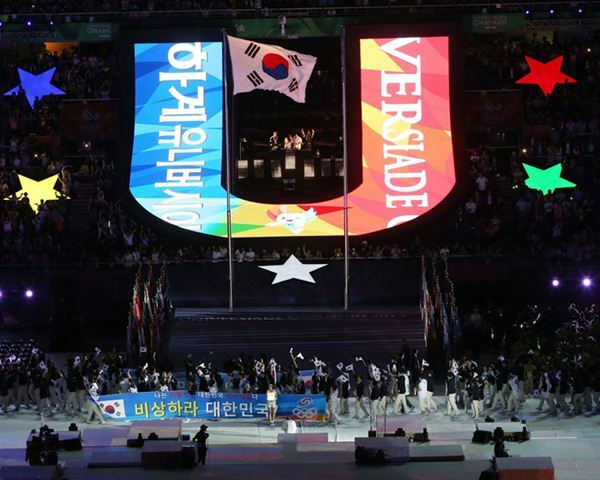 The last time baseball was included at the Summer Universiade was in 1995 in Fukuoka, Japan, where the bronze medal went to the host-country, silver to S. Korea and the most precious metal was taken by Cuba. In addition to the Summer Universiade, four disciplines of baseball/softball (men's baseball, men's softball, women's baseball and women's softball) will be on display for the first time in history at the pinnacle multi-sport stage of the Americas, the Pan-Am Games, which open 10 July in Toronto, Canada.